SEPTA Lot off Lancaster Avenue – Located west of the westbound station platform with 13 spaces ($1/day). 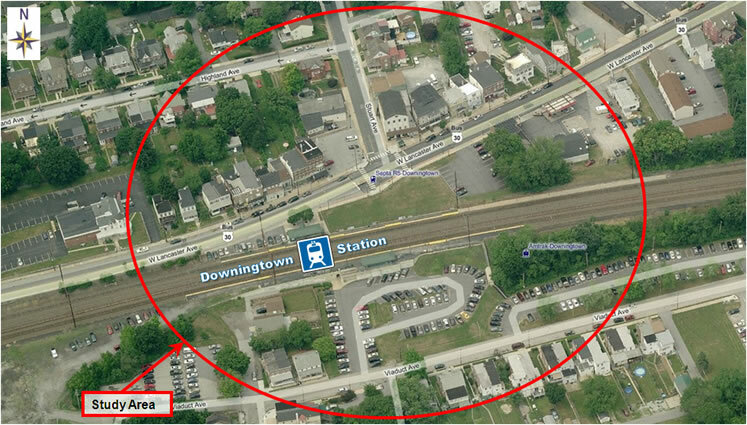 Municipal Lot off Lancaster Avenue – Located east of the westbound station platform with 37 spaces; (2 hr. free parking and permit parking). SEPTA Employee Only Lot off Viaduct Avenue – Located west of the westbound station platform. ($1/day). SEPTA Lot off Viaduct Avenue – Located south and southeast of the eastbound platform with 213 spaces; ($1/day). Municipal Lot off Viaduct Avenue next to Park – Located southeast of the westbound station platform with 92 spaces. ($0.50/day). There is one bicycle rack available to accommodate a total of 2 bicycles. Krapf Transit Route A – Service between West Chester and Coatesville with connections to SEPTA is made at Exton Mall to Bus Route 92. The eastbound (inbound) platform currently is not wheelchair-accessible. Located in the western suburbs that is 32.8 track miles from Philadelphia's Suburban Station. In 2011 the weekday ridership (boarding) increased to 692 and 90 percent of the 346 parking spaces are utilized.